What are my special features? Yorkshire Forced Rhubarb (Rheum rhaponticum) is an out of season rhubarb that is first grown outside for a period of two years so that the exposure to frost toughens the roots. After initial exposure to the frost, the Rhubarb is lifted from the ground and placed into forcing sheds. Once in the darkened sheds, heat is applied causing the rhubarb to grow quickly in search of light. 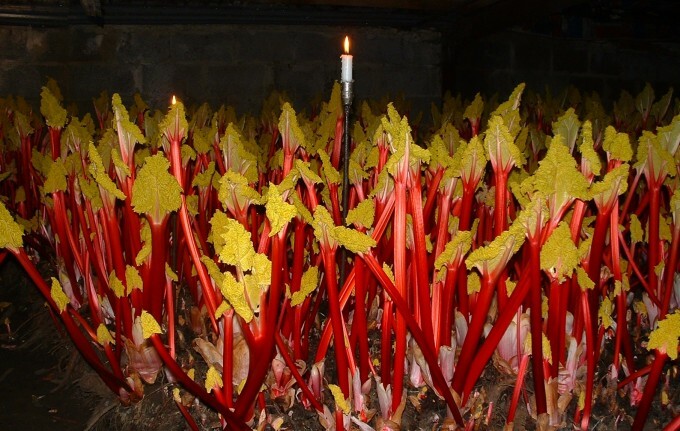 The Rhubarb is harvested by candle light to maintain the tenderness of the shoots and ensure that growth continues. If the crowns are exposed to too much light they will cease to grow and Photosynthesis will occur resulting in a bitter flavour. The sticks are harvested by hand to prevent other crowns to rotting due to botrytis. After the rhubarb is harvested the crowns are composted, ensuring a more sustainable production. This growing process produces rhubarb that is sweeter and more delicately flavoured with an especially vivid red colour. In terms of colour the inside of the stem is a bright white, with the outside a vibrant blood red. In 1877 the forcing of rhubarb began in Yorkshire, the first place in the world to construct special forcing sheds. Cheap coal from local mines heated the forcing sheds which helped produce rhubarb early in the year when fresh fruit was scarce. West Yorkshire once produced 90% of the world’s winter forced rhubarb. In the late 1960′s and early 1970′s, many small fields which had been used to grow rhubarb were sold for building houses, as they were very close to urban areas In the Rhubarb Triangle (area between Morley, Wakefield and Rothwell) there are now only around 12 growers. Don’t lose me… cook me!